Discussion in 'Spares for Sale and Wanted' started by GLK, Sep 2, 2018. I have these two tops for sale - AMG & Blue Laurel Roadster designs. 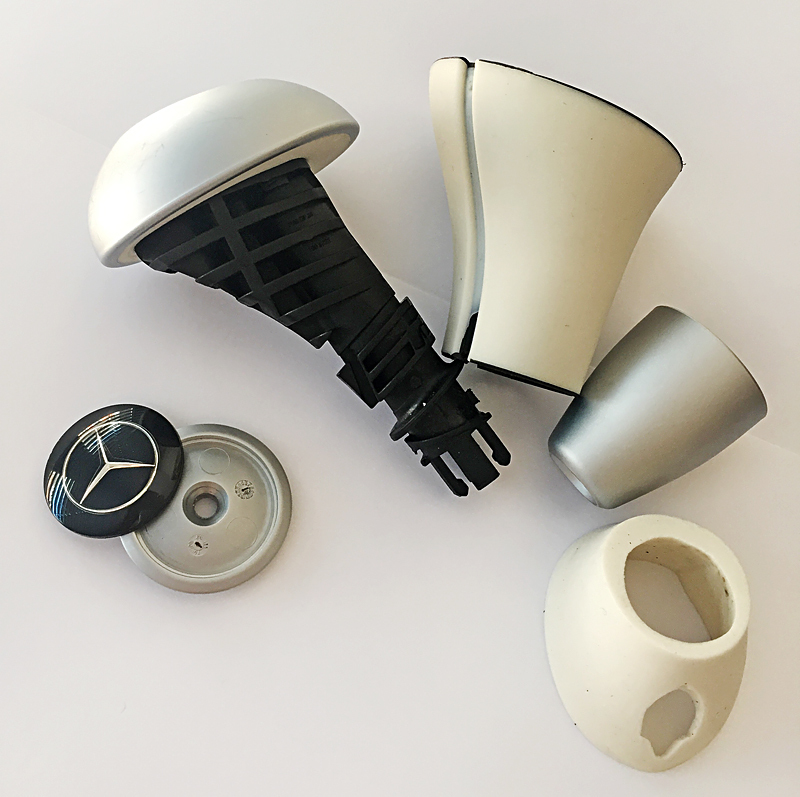 These will fit many models, but please note: these are just under 29mm in diameter, some gearshift knobs are 25mm, so please double-check. Of course, they can be trimmed (I have done two), or the holding rings can be widened to accommodate 29mm. I'd be happy to provide detailed instructions as to how to get the handle apart, if required. £15 each delivered, or £27 if you want both. 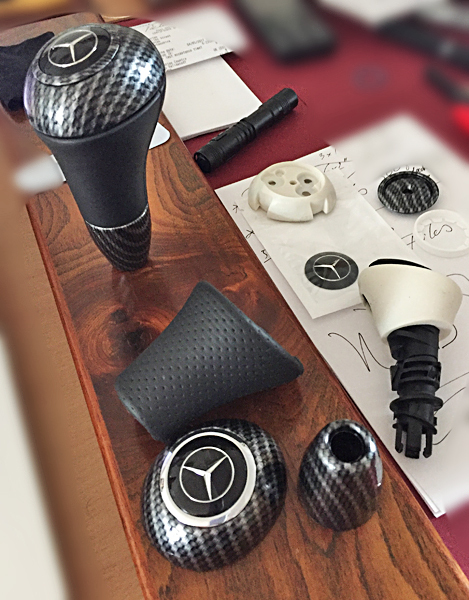 Almost all modern Mercedes gearshift knobs are essentially the same. If yours looks similar to the one pictured above, then you can fit the new badge. You might have to widen the holding ring from 25.8mm to 28.8mm - I have done that, and it only requires a steady hand and some precision - nothing complicated. Alternatively, the badge itself can be trimmed down to size - depends what process you're more comfortable with. I. The top badge is fixed with a double-sided tape, and its removal is the only part of the process, that's not immediately apparent. II. 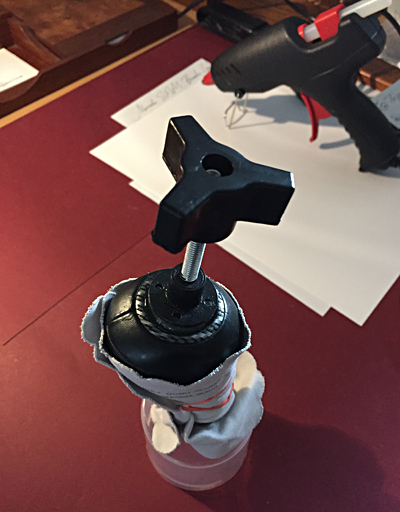 Apply a drop of hot glue on top of the badge, and affix the lever, making sure it is upright. Once dry, pull up, steadily and without twisting, until the badge disengage. 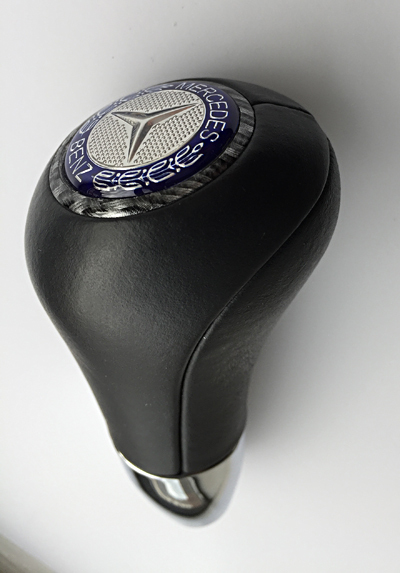 Once removed from the gear knob, and the glue is at the room temperature, a few drops of pure ethyl alcohol will lift the hot glue residue without any trace whatsoever (give it a second or two to react, carefully separate the lever from the badge, then roll the glue off with your finger - do not use any tools). III. 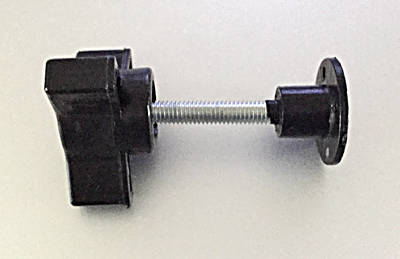 After that, it is pretty straightforward: unscrew the central screw, remove the holding ring. If you only want to replace the badge, nothing further is required. 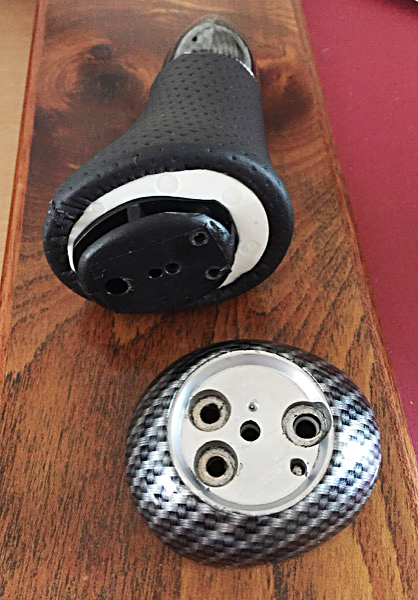 However, you can proceed further disassembling the handle, should you wish to update the leather, or 'metal' parts - these are actually a metal-coated plastic - please keep that in mind when handling them. Holding ring painted after widening, and badges lacquered (same types, but not the ones I have for sale now - these were spares). mercmancdi, Blobcat and carlls like this. Price dropped to only £12 each, or £20 for both. mine out , unless you know it fits mine ok . I don't know for sure, but as long as yours is smaller, you can either trim the badge or trim the surround ring - as above. Or, it could be the 29mm type, then it's a direct fit. My original badge was 25mm, so this above is trimmed. Ok will check mine tomorrow. It is much easier to remove the badge as I described above, otherwise you're risking damaging the holding ring. You need the diameter without the chrome ring, but I'm pretty sure it will be 25mm, so the new badge (or the ring) would have to be trimmed. Come to think of it, it would have to be the badge, that gets the trimming - chrome ring won't look right widened, as you lose the coating on the inner curve. Wighty and GLK like this. That looks nice, both of them. May I suggest removing the ring, and polishing out (and filling up with something like JB Weld) the damage, and re-painting it in black gloss - it would look fantastic with the AMG badge, alternatively paint it chrome / silver to go with the blue roadster badge. Whilst the ring is out, you might want to touch-up the leather too - it'll give you a 'like new' feel and look. PS That's exactly why I advised against using a small screwdriver, etc to remove the existing badge - using the hot glue method is a bit more work, but leaves the holding ring undamaged. on the ring ,that’s a wipe away bit of the dirty glue. Lol. I will send we photo when finished. Until I decide. I see the mark you see in photo it tiny just photo blew up I think it’s been off before. Lol. I will send we photo when finished. Ah, good - because it looks like a 'prying up with a metal tool' kind of damage, in the pictures. I had the ring and quite few other bits, hydrographically printed (carbon dip) - see the last photo in the original post. 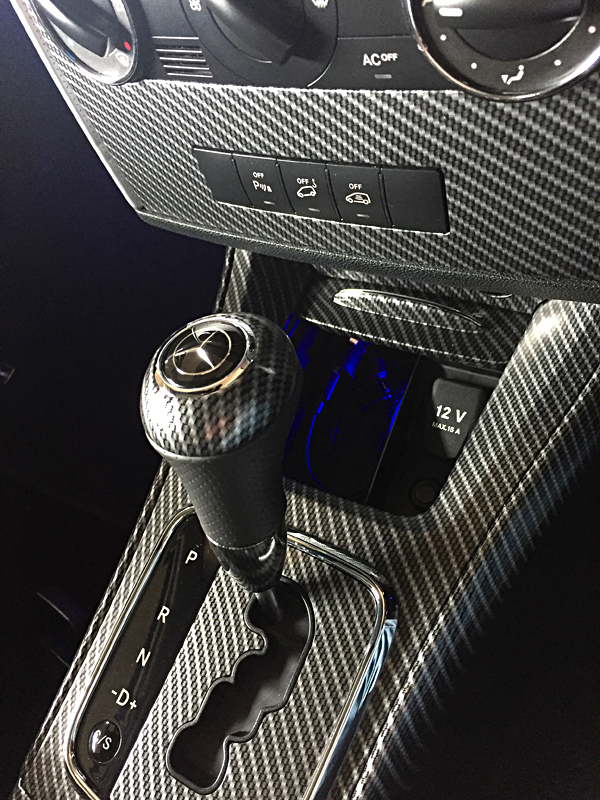 The one on the foreground is my gearshift handle, with a perforated leather and carbon top and bottom. With the "metal" ring - it's not actually metal, it's coated plastic, so keep that in mind, when working with it - the top layer is either chrome or matt aluminium (depending on the model trim), the bottom layer is copper-based (so don't polish too much off, or you end up with a red metal showing through. night shift he’s going to spray it with as close to chrome finish as he can. I am a fan of chrome. Lol. Sounds like a professional job - that's great: I didn't have that option.